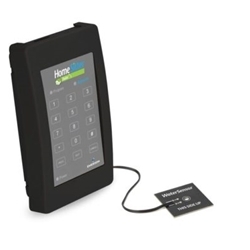 The HS-700E HomeSitter Dialer will sound an audible alarm and call up to three telephone numbers using a landline phone connection to protect your home from damage caused by temperature extremes, water leaks or power failures. Set-up takes only a few minutes and there are no monitoring fees or installation costs! All you need is a phone line and a power outlet. The HomeSitter freeze alarm/heat alarm will automatically call out to notify you if there is a drop in temperature (below 45°F/7°C) or a rise in temperature (above 85°F/34°C), accurate to +/- 3 degrees. This temperature alarm feature can help you prevent frozen/burst pipes due to furnace failure or prevent mildew and humidity damage when an air conditioner stops working in the summertime heat. Included with the HomeSitter Dialer is a remote wired water sensor that can be placed in the basement, near a water heater, below the kitchen sink, washing machine, or inside your sump pump. Early detection of water leaks with a water alarm can save many thousands of dollars in property damage! The HomeSitter Dialer power failure alarm will also notify you of a power outage at your monitored property. Knowing the power is out enables you to take action before expensive consequences can occur. You can even select how long the power is out before the unit calls to avoid nuisance calls. The HomeSitter Dialer offers great peace of mind and protection for your home and requires no installation or monitoring fees! When the HomeSitter Dialer calls, it plays an easy to understand message, clearly stating what type of problem (temperature, water or power) is occurring at your monitored location. The HomeSitter will continue to call until the alarm is acknowledged and cancelled. The HomeSitter requires a standard telephone line or digital telephone service (digital cable phone service, VOIP, DSL phone service). Two (2) AA back-up batteries are required, but not included. Note: Some digital phone services require uninterrupted power to operate. This means the HomeSitter will not be able to call out during a power failure with some of these phone systems. Check with your phone service provider with any questions.